Not much material today. I took another vacation day (darn I hate having to miss work) and didn’t get any appreciable work done at home, but ran errands and made chili in the crockpot and gave Vegas a haircut. So that’s the topic tonight. She’s grooming furiously now that she can find her delicate pink skin. The bunny and dog together is such a cute photo! 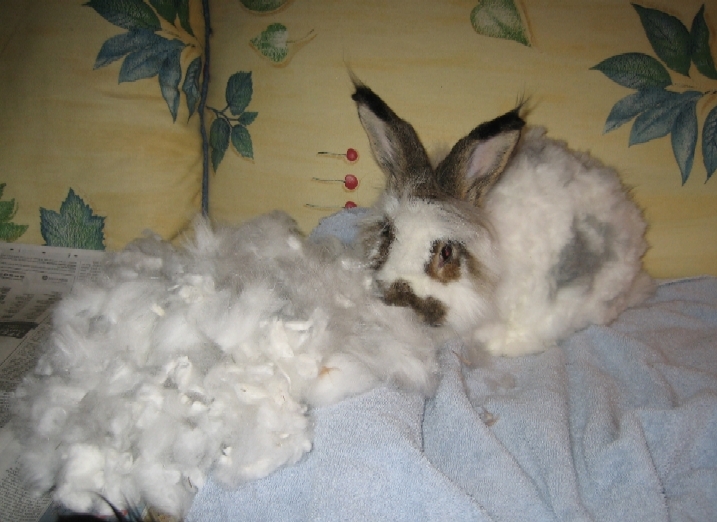 And that pile, that’s all from the rabbit fur cut? Wow! What do you do with it? That’s like a whole ‘nother bunny. So cute. Awww – I love bun floof! If Abby & Vegas compined their poofs, they would be unstopable! *Giggle* at doing the love nibble – my girls do that too!